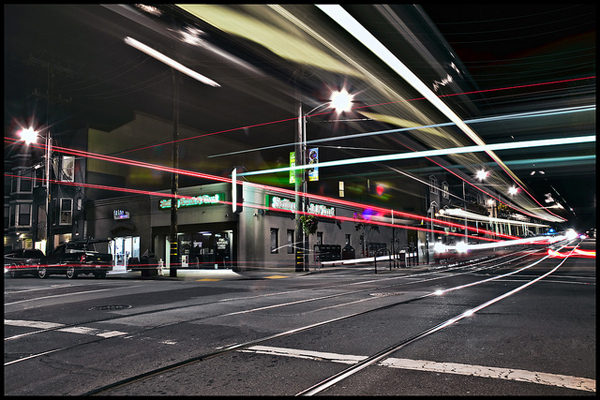 The streak in the photo is a Muni train in the Noe Valley of San Francisco. What a great night-time exposure! For those of you who are photographically minded, Bob took the photo with a Pentax K-5 digital SLR with an 80 ISO, f/13.0 aperture, 14 second shutter speed and a focal length of 18 mm. Translated: he kept the shutter open for 14 seconds, which allowed him to use a higher F-stop to keep more of the objects in the image in focus. I also encourage you to check out more of Bob’s work in his photostream — the link is above. We’ll hopefully feature more of his images in Art of Transit soon. For those of you interested in night-time photography but completely befuddled by some of its technical aspects — that would be me — here are a couple of resources that may prove helpful. The Bay Area photographer G Dan Mitchell has some hints for night-time photography on his blog (take the time to check out his landscacpe work in California on the blog). And here’s the website for the Nocturnes, a group of photographers in San Francisco who specialize in night photography. Go to their ‘resources’ section for links to tips for better night-time images. Thanks for the photo info! Always very interesting to read.